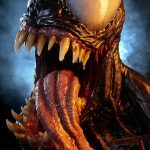 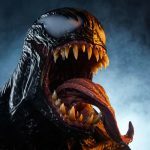 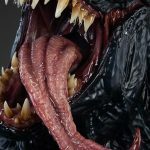 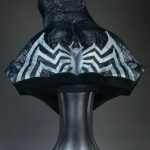 If you have symbiote fever following the release of the new Venom movie, then you may want to greet guests at your home with Sideshow Collectibles' new, impeccably detailed life-size Venom bust that looks real enough to take a bite out of anyone brave enough to get close to its tongue. 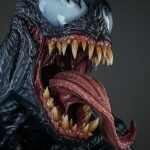 Slated to ship out next summer, Sideshow's limited edition Venom fiberglass bust stands 27.5 inches tall and is crafted in 1:1 scale. 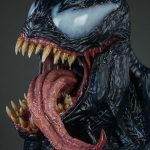 If you're a fan of the Marvel comics character from the Spider-Man universe, this may very well become the Holy Grail of all Venom collectibles. 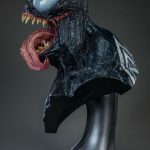 We have additional details and photos of the life-size bust below, and to check out the full photo gallery, be sure to visit Sideshow's website. 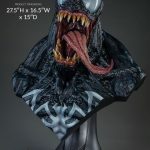 Venom Life-Size Bust: "Sideshow is proud to present the Venom Life-Size Bust, putting the ultimate symbiote on your shelf in epic 1:1 scale.